Port Blair, Dec. 26: The Lt Governor, Lt Gen (Retd) A K Singh, today led the Islanders in paying rich tributes to the tsunami victims of the Islands, who lost their lives during the devastating tsunami on 26th December 2004. To mark the 9th anniversary, a solemn function was organized at the Tsunami Memorial at Rajiv Gandhi Water Sports Complex, Aberdeen in which the Lt Governor laid wreath at the memorial followed by paying of floral tributes by the Hon’ble Member of Parliament, Shri B P Ray, Chief Secretary, Shri Anand Prakash, Chairman (PBMC), Adhyaksha Zilla Parishad (SA), Chairperson (SSWB), Municipal Councillors, PRI representatives, senior officers of the Administration, prominent citizens and the general public. 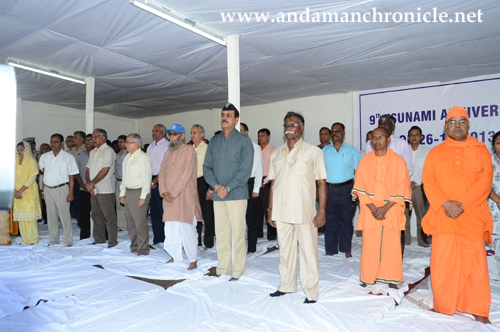 A ‘Sarva Dharma Prathana Sabha’ and two minute silence was observed to pay homage to the departed souls.